Select “Zoom” and switch it to “On” or “Off“. You can also enable and change other settings as desired. How do you use the Zoom feature once this is enabled? 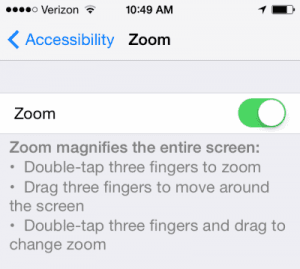 Double-tap on the screen with three fingers to enter zoom mode. You can double tap with three fingers while keeping your fingers on the screen after the second tap to control zooming by moving your fingers up and down the screen. Double-tap with three fingers again to exit zoom mode. My device is stuck zoomed in. What do I do? We actually wrote a post about that. Try double-tapping with three fingers. How. An I get iPad to remember a zoom in google maps for example? This is not up to date. I have an iPad Pro with everything in Zoom settings turned off, but randomly double tapping in an app still creates a weird zoom effect. Would love a way to disable it, but this solution doesn’t work. My iPad used to have a zoom controller on the screen that allowed me to zoom in to any magnification and then position the text for reading. Very useful feature. One day that just disappeared and then double tap with three fingers started. Not as good but at least something. Now that doesn’t work. Zoom is so small why bother using. Why can’t we just spread out thumb and forefinger apart to zoom and KISS? Double tapping with three fingers used to work on my iPad. Now the amount of zoom is so small there’s barely a difference.